A kangaroo is an Australian mammal. The Eastern Grey kangaroo is found in east Australia. 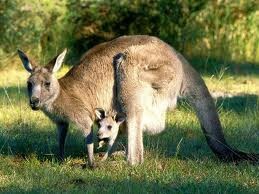 It's scientific name is Macropus Giganteus. 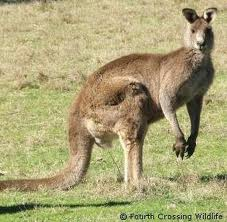 The kangaroo uses its large tail for balance, steering and to rest. It is covered in woolly fur. 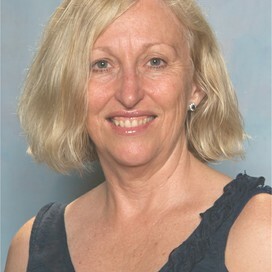 The kangaroo eats grass, green leaves and shrubs. The tiny joey is born about 33 days after its parents mate. It climbs into the pouch. Did you know that when the female Red kangaroo is ready to give birth she cleans her pouch?